How long home renovation and construction projects last? Time required to complete a certain remodeling task is a factor which determine the labor cost of any home renovation project. Number of man-hours to perform certain work successfully depends on complexity and customization level. Using high end materials, fixtures and finishing products along with superior on-site work performance which consumes significant amount of time to get that done will increase labor expenses accordingly. While planning any renovation project homeowners should clearly define priorities and on the low budget make realistic expectation about quality of work. After in-home inspection and determining a scope of work to complete a contractor will estimate number of man - hours and finalizes the time frame depending on the project urgency and labor availability. Some minor repairs as well as smaller projects which normally take a few hours can be done as the same day service with no prior on site consultation require. 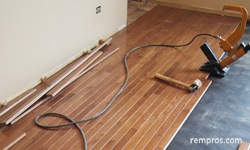 How long house remodeling will last will also depend on a contractor’s ability to manage the work. Poor organization of a home improvement project might lead to significant delays and waste of time. Hiring experienced professionals will ensure not only quality, but completing the work on time. Do it yourself projects normally take much longer to perform because lack of skills and reading or watching installation instructions will consume time as well. *Time was estimated based on standard installation by professionals excluding all preparation and additional work which might be necessary to complete. Homeowners who are planning to do it yourself normally spend much more time.